Pomegranate trees are known for their delicious fruit called pomegranates. The trees go as far back as ancient times when they were featured in Egyptian art and mythology, as well as mentioned in the Old Testament and in the Babylon Talmud. The pomegranate tree has received renewed attention in contemporary times not only because it’s an attractive addition to a landscape, but because the pomegranate fruit promotes good health as it is rich in antioxidants. Pomegranates trees are small trees that usually grow about 12 to 16 feet high, but can also reach heights of 20 to 30 feet, according to the California Rare Fruit Growers website. Although it’s typically a deciduous tree, in some regions the tree’s leaves stay on the tree year-round. Its truck has a reddish-brown bark that later turns gray, and it has stiff, angular branches that are often spiny. These trees are self-fruitful, meaning they're able to fertilize themselves. Pomegranates are known for being trees that live long--some European specimens have been known to live more than 200 years. Although these trees have good longevity, the tree’s vitality decreases after about 15 years of age, according to the California Rare Fruit Growers. Besides the Middle East, pomegranates came from Egypt, India and southeastern Asian countries such as Malaya. Today these trees continue to grow in Africa, India and the Middle East. In the United States they grow best in hot Mediterranean climates and desert regions such as the Southwest. 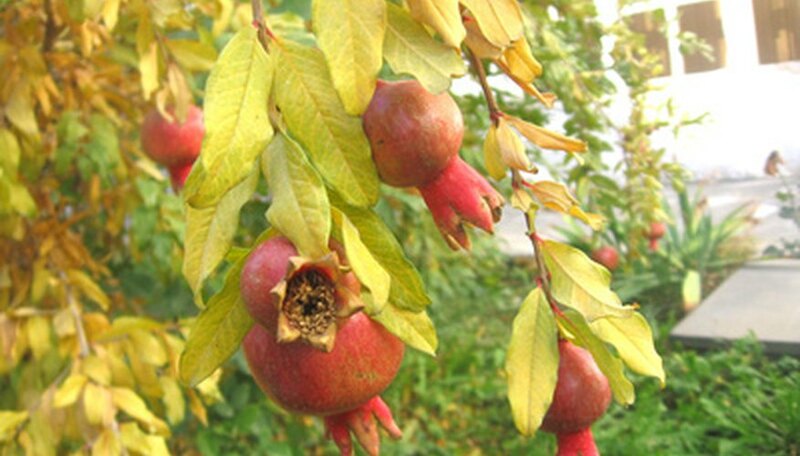 There are four main types of pomegranate trees. The Wonderful pomegranate tree is the most popular species worldwide and produces large fruits that have red skin and red juicy flesh. The Grenada is similar to the Wonderful tree, although its fruit blossoms have a deeper red color and are much smaller fruit. The fruit of Sweet pomegranate tree is large and has light pinkish flesh. This variety is so-named because it produces the sweetest fruit of all pomegranate trees. The Angel Red variety bears its fruit earlier than other trees and yields fruit with a bright red color. Fruit from this variety has the highest amount of juice per fruit among pomegranates. Although pomegranate trees can adjust to various types of soils ranging from pure sand to heavy clay, they have a better production of fruit when grown in heavy, deep loams. When grown on alkaline soil, a pomegranate grows slowly Optimal growth is linked with deep, moist, somewhat heavy soils that have a pH range of 5.5 to 7, according to the University of Florida Extension. Leaf blotch and fruit spot are two destructive diseases of pomegranate trees. Symptoms include leaves with small, dark reddish-brown or black patches with infected leaves turning pale green and falling prematurely. Symptoms on fruit are dark brown spots that begin as circles, but then become irregular. Scale mites are occasional pests, but do minimal damage and can be managed by applying an oil spray during winter when there are no leaves on a tree.